The photo blog on The Atlantic has been running extended looks back at images from World War II. Today's theme: Japanese-Americans forcibly removed from their homes and businesses and shipped to internment camps in the middle of the freakin' deserts. 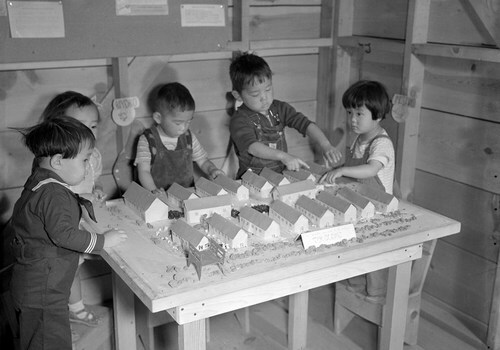 The caption on #39 just bummed me out: "Nursery school children play with a scale model of their barracks at the Tule Lake Relocation Center, Newell, California, on September 11, 1942." Their barracks. On the bright side, check out the sweet little pine plank nursery chairs they're standing on. How many civil right's a brother gotta give up to score a few of those, I wonder? That's where my mom was born, right before the camps were closed (but at that point it had been turned into the Tule Lake Segregation Center).